Robert Dear’s attack on the Planned Parenthood clinic in Colorado Springs just over a week ago and the shooting in San Bernardino last week have brought the question of who is identified as a terrorist back into the limelight. Lots of people have highlighted how the ethnicity or religious identification of the attacker has often influenced whether the attacker is identified as a terrorist or a mentally disturbed individual in a lone wolf attack. 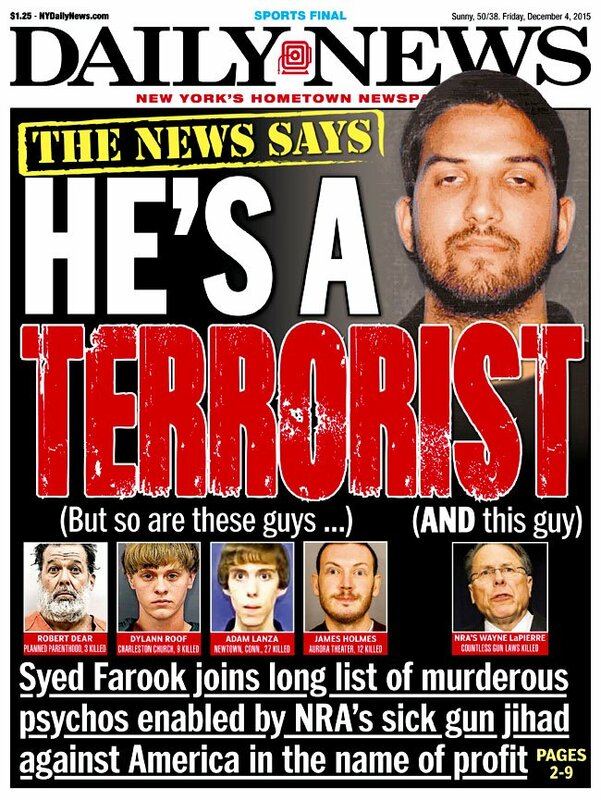 The Daily News cover following the San Bernardino shootings (4 December 2015, pictured above) illustrated this critique by identifying Ronald Dear, Dylan Roof, Adam Lanza, and James Holmes as terrorists, as well as the NRA’s Wayne LaPierre. In this cover and statements from figures like Mike Huckabee (calling Dear’s actions “domestic terrorism”), the critiques of the reluctance to apply the terrorist label to white Christian attackers have won a victory, of sorts. The inconsistent use of the terrorism label is a serious concern, as it reinforces the prejudice that some communities are more prone to violence and instigating large-scale attacks on civilians, despite the evidence to the contrary. The ethnic and religious identities of attackers also appear to influence how much care and reticence about jumping to conclusions the police and media employ in addressing such incidents, as my colleague highlighted last week. However, just as some have critiqued efforts to employ the label “Christian terrorist” for figures like Robert Dear (as it has similar problems to the language of “Muslim terrorist”), I am not certain that an expanded use of the word “terrorism” to more mass shootings like the Planned Parenthood shooting or the Sandy Hook school shooting is beneficial either. Such an expansion of the terrorist label to a wider set of violent incidents may not reduce the discrimination, and sometimes violence, against people whose religious identification or ethnicity-whose difference-some have stereotyped as a potential terrorist. Increased fears of terrorist acts and calls for vigilance heighten suspicions of some groups, regardless of the data about the identity of the more common attackers. The expansion of the terrorist label also may serve to increase the fears that generate support for the militarization of the police, greater government surveillance, and the suspension of individual liberties (particularly for marginalized groups) for the sake of our security. The winners in this expansion, I fear, are the special interests, both government agencies and private corporations, that gain increased funding to provide security for the general population in the context of a perpetual war on terrorism. Trying to use the terrorist label to address prejudicial perceptions may have serious unintended consequences. Instead of adopting the rhetoric of terror, analyzing who benefits from the fears that such rhetoric accentuates (in combination with the violence itself) might be more productive.